The Law’s “personal event” language, provides employees with significant leeway to request a schedule change. Some of the “personal events” explicitly mentioned in the new Law include: (1) caring for a child under the age of 18; (2) caring for a disabled individual that qualifies as a “care recipient,” as defined by the new Law; (3) attending a court proceeding to which the employee, a family member, or care recipient is a party; and (4) any other qualifying reason under New York City’s paid Safe and Sick Leave law. This new Law also contains a retaliation provision. Employers cannot punish employees who decide to exercise their rights under this new Law and are prohibited from terminating, demoting, suspending, or negatively affecting an employee’s job in other ways. Otherwise, the employer would be engaging in unlawful retaliation and may be subjected to legal action. Unlike some parts of New York City’s old Fair Workweek Law, the new Temporary Schedule Change Law applies to all industries and is not just limited to retail and fast food workers. However, it gets trickier when certain employees try to exercise their rights under the City’s new Law. For instance, while unionized employees covered under a Collective Bargaining Agreement (“CBA”) are generally protected under the City’s new Law, the Law does contain an exemption. Unionized employees covered by a valid CBA are not protected if the employee’s CBA: (1) has a provision that waives the new Law’s schedule accommodation requirements and (2) addresses temporary work schedule changes. Furthermore, there are other New York City employees that are entirely excluded from the new Law. These employees include government employees and most employees who work in the television and live entertainment industry. A few days after the new Law took effect, the New York City Department of Consumer Affairs (“DCA”), the agency that enforces the Law, released a document intended to serve as guidance and to help both employers and employees better understand the new Law, its requirements, and its limitations. In the Frequently Asked Questions (“FAQ”) document, the DCA makes it clear that this new Law cannot be waived. In other words, employers that are opposed to the new Law have to deal with it. Employers cannot force employees to sign anything that would limit or prevent an otherwise eligible employee from exercising his or her rights under the new Law. Moreover, this guidance document lays out certain steps that both employees and employers alike are required to follow. For instance, an employer’s response to an employee’s temporary schedule change request must include: (1) whether the request was approved or denied; (2) the accommodation provided (if the request was granted) or the reason for the denial; (3) the total number of temporary schedule changes that the particular employee has requested; and (4) the total amount of days the employee has taken off from work due to previously approved temporary schedule changes. Lastly, the guidance document includes two additional requirements that are important for employers. Specifically, employers are required to (1) hang up notices regarding the new Law in visible areas that are accessible to employees, and (2) maintain electronic records, for at least three years, showing their compliance with the new Law. Notably, an employer’s failure to comply with the Laws record keeping requirement results in a favorable presumption for the employee, also known as a rebuttable presumption, and forces the employer to prove that they did not violate the law. Indeed, this burden may be difficult to meet. In sum, while most workers in New York City can now breathe a sigh of relief if they need to temporarily change their work schedules or take some time off from work, employers are left with the headache of increased leave and schedule approval obligations. 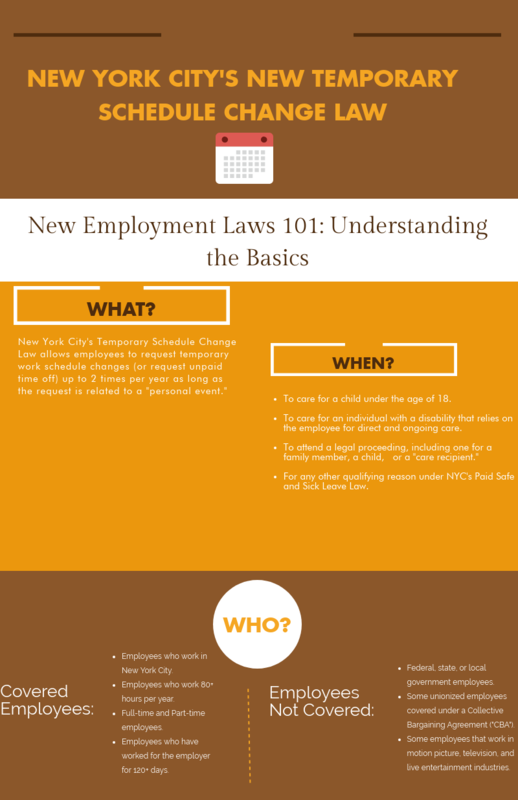 This law is certainly a win for eligible New York City workers, but it is important for these employees to understand the laws limits. If you have questions about New York City’s Temporary Schedule Change Law or if you are unsure whether you are protected under this new Law, our New York City employment lawyers may be able to guide you. 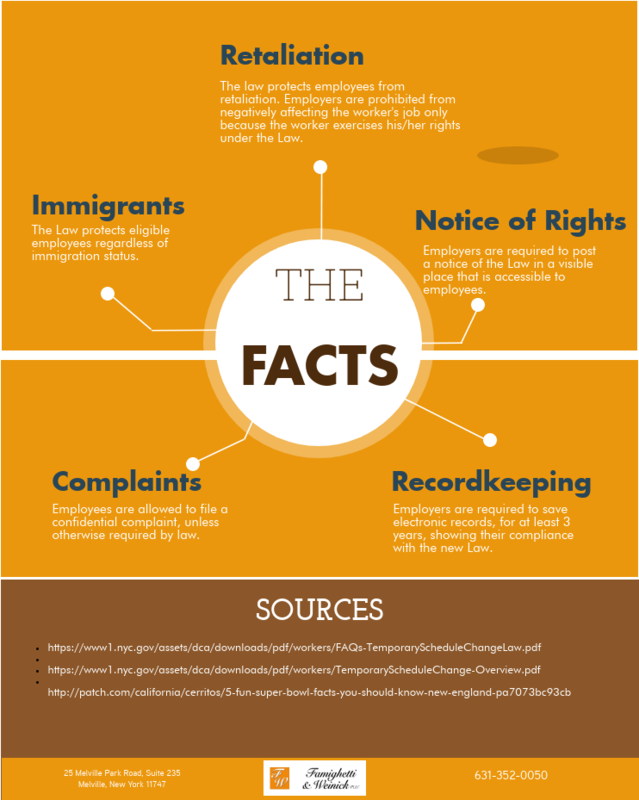 Call us at 631-352-0050 or visit our website at http://www.linycemploymentlaw.com to schedule a free consultation. Today’s New York employment law blog was written by law clerk Thalia Olaya.